Our employees’ expertise and the company’s experience have always produced successful solutions for our customers. The certifications that our employees hold are also the most transparent and objective measure of our expertise that we can present our customers with. We are proud to say that we have a – unique in Germany – double Certified Architect certification for NI TestStand (CTA) and NI LabVIEW (CLA). They are complemented by Certified LabVIEW Developer (CLD) and Certified LabVIEW Associated Developer (CLAD) certifications. As our customer you can count on the best service and support. 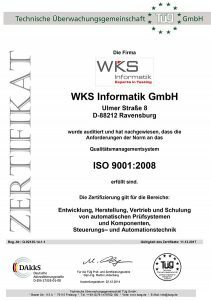 In order to provide you with these and to make sure that the quality of our products is always high and well-defined, we have adopted the DIN EN ISO 9001:2008 certification for all the company’s processes. This norm describes the quality management system and the proof tests are done by an external auditor. We are currently in the middle of acrediting process for the DIN ISO 17025 .